emphasizes experiences in the Alaskan wilderness. One of the other things I often tell folks is how the seals will float in the water as the tide is going out so they do not need to climb up on the rock. Unlike Steller’s sea lions, the harbor seals seem to be weak climbers. It seemed that no sooner had I said this when I noticed a seal climbing out of the water up on to the rocks. This was followed by a second and third. I felt a little silly, but tried to recover by noting how their climbing was fairly labored and weak, and I had not seen them doing this before. I did not think much about it until later. After we dropped our passengers off at their cruise ship, the captain told me that there was a pod of orcas teaching their young to hunt. He said as we were rounding Povortni Point he heard on the radio from another Allen Marine vessel that the orcas were at Caution Island with a harbor seal. We were already running just a little bit late, so we couldn’t afford to go back (as it was, the ship left promptly after we dropped off our passengers). The news we heard from the boats that were able to watch was the adults were using a harbor seal to help their young practice hunting techniques. The adults would keep the seal from getting away and demonstrate techniques of attacking and stunning an animal in preparation for eating it. These include ramming, slapping with tails, and jumping out of the water to land on top of the prey. Apparently a later boat saw them actually consuming the seal. I imagine that the final minutes (hour?) of the seals life was terrifying, the stuff of seal nightmares. I can’t help but think the seals that were uncharacteristically climbing up on the rocks (which we observed probably about an hour before the orcas were spotted) knew the orcas were in the area and wanted to get out of the water if at all possible. The last I heard, the orcas had turned their attention to ‘playing’ with a common murre. Based on what I have heard previously, it is unlikely that they will consume the bird, but they do seem to use them on occasion to practice hunting techniques. It was a little disappointing to find out we just missed this opportunity to see some orca activity. 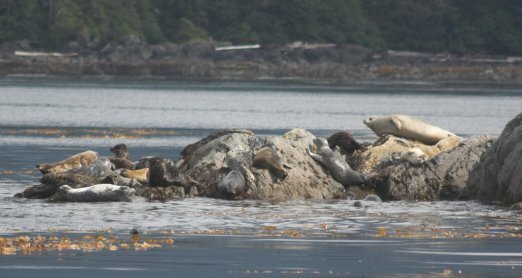 It is my understanding that these animals move through Sitka Sound on a fairly regular basis, but they move quickly and do not seem to stay in one area for long, so seeing them seems involve getting a little lucky sometimes. People who have worked these tours for a number of years told me they usually only see orcas a handful of times a year. What made today even more interesting to me was that just yesterday I read about an orca/harbor seal encounter witnessed earlier this month north of Sitka (scroll down a little to see photos and link to video; scroll down into the comments to see a more complete story, the comment begins The story in two parts). This entry was posted in marine, marinemammal, photo. Bookmark the permalink.